There's some fun polls going on this month...One is ours and the other is from our friends at D.U.B...Scroll down to see! Author, Christina Tinglof, is on the hunt again for parents of twins for another article she's doing for TWINS Magazine. 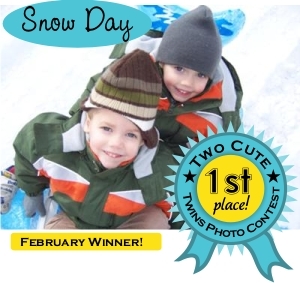 Plus, don't forget to see the February TwoCute™ contest winner. Did you or do you plan on breastfeeding your twins? Last month's newsletter poll asked "How Do You Feel About Plastic Surgery After Twins?" 46% answered "If it was less expensive I may consider it." 27% answered "I'm all for it!" 11% answered "There's no way I would do it!" 9% answered "It's just not worth it." 7% answered "I don't think I need it.". *Stay tuned each month for a new poll and results! Take A Poll, Get A Discount! Our friends at Double Up Books are running a really fun poll where you actually get to vote on your favorite twin related books for their 1st Annual DUBBE Book Awards! At the end of the poll you will get a discount code to be used towards a purchase at www.DoubleUpBooks.com. Simply click the banner on the right to get started! Author and mother of twins, Christina Tinglof is researching another article for TWINS Magazine! This time it deals with twins and weight. Namely, what do you do when one twin is overweight while the other is not? How do you handle this tricky and sensitive issue? Do you put the whole family on a diet? Do you try to get the entire family outside for a little exercise? In other words, how do you help the twin struggling with weight without comparing that child to his thinner co-twin? If you have young or school-age twins and are personally dealing with this issue, email me your story. As always, I'm forever grateful for the help. Here's February's winner! Looks like twice the fun in the snow for these two cuties! Now taking entries for March! Do you want to be a Featured Mom? Send us your request and you might be next!